Sift the flour and baking powder into a large bowl. Stir in the sultanas, sugar, mixed spice and salt. Whisk the eggs in a bowl. Stir in the butter and pineapple in syrup. Add to the flour mixture and fold to combine. Spoon among the lined pans. Bake for 15-20 minutes or until a skewer inserted into the centres comes out clean. Set aside in pans for 5 minutes to cool before turning onto a wire rack to cool completely. Meanwhile, heat the chocolate and cream in a medium heatproof bowl over a saucepan of simmering water (make sure the bowl doesn't touch the water). Stir with a metal spoon until the chocolate melts and the mixture is smooth. Place in the fridge for 1 hour to chill. Use an electric beater to beat until soft peaks form and icing is thick. 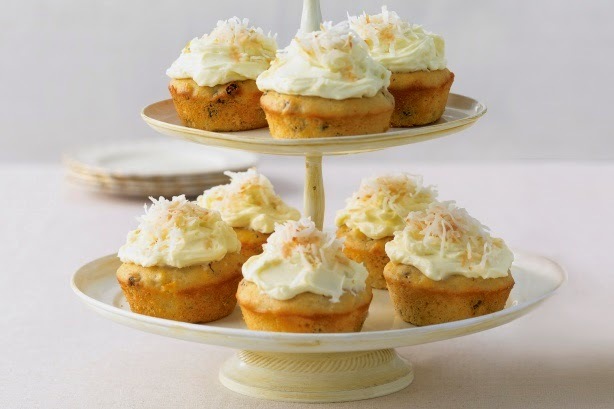 Spread the icing over the muffins and top with the coconut to serve.